Brightest High Power Handheld Nightlight Flashlight LED / LED Tactical Flashlight / Torch light - Best Value for your money, high quality Ultra Bright LED Tactical Flashlight with high intensity brightness and range. 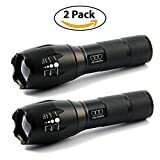 This is the best flashlight for outdoor activities, tactical use, emergency, search missions, routine patrolling, camping, hiking, backpacking, fishing, cycling, cave exploring, household use and self-defense. 100% SATISFACTION GUARANTEE and 10-YEAR WARRANTY - The Gold Armour LED Tactical Flashlight comes with a 100% Satisfaction Guarantee and also backed by a 10-year warranty. Advanced Design: Anti-abrasive coating. Toughened, ultra clear glass lens, with anti-reflective coating. 5 Light Modes: Full Brightness, Medium Brightness, Low Brightness, Strobe Brightness, SOS. Zoom Function: Zooming is adjusted by extending and shortening the head for broad beam or spotlight. Aluminum alloy material.